Parenting is a tricky business. Just when you think you're ahead, you screw something up and have to start all over again. Actually, that's not only parenthood, that's life most of the time. In parenthood and in life, there are those small victories, those moments when you feel like a beam of light is shining down on you and there's an angel chorus singing "Ahhhhhhhh" in your honor. And we have to hold onto those moments for dear life to get through all the screw ups. Last week, Tim left for his bi-annual retreat. Twice a year Tim goes to his parents' cottage a couple hours away to retreat from the stress of being the sole provider of such a large family and being the guy we all love to spend time with and constantly ask questions of, and work and coaching and not fixing stuff around the house. I dig that he goes away because he gets the sleep he so desperately needs and he gets sort of sappy and sweet. It's like he gets the opportunity to feel what well rested feels like and take a look at all the good stuff we have in our life. It's great. And I love it because I am in charge. There's no negotiating or communicating every decision about the day or the kids or what show we watch at night. I have all the power. This time, I had big plans. I was going to be the most fun mom ever, write a ton of work to submit everywhere I'd ever wanted to be published, go here and go there and watch The Real Housewives on the big TV in the living room instead of the bedroom because Tim can't stand it, and I was going to fix some of the things around the house that needed fixing. The only problem was that Tim was going away for four days not 40. My expectations were grand to say the least. The first day he was gone started really well. I cleaned behind the refrigerator and the stove, which by the way I didn't even know we were supposed to do that. I found the house key that Peyton lost and everyone had supposedly looked for. I filled out a job application and ran a couple miles. I was feeling like Super Woman. Feeling heady with accomplishment and power, I declared that "I will find the Apple TV clicker!" The stupid Apple TV clicker had been missing for over a week and that meant no Netflix and so we had all been a little on edge. 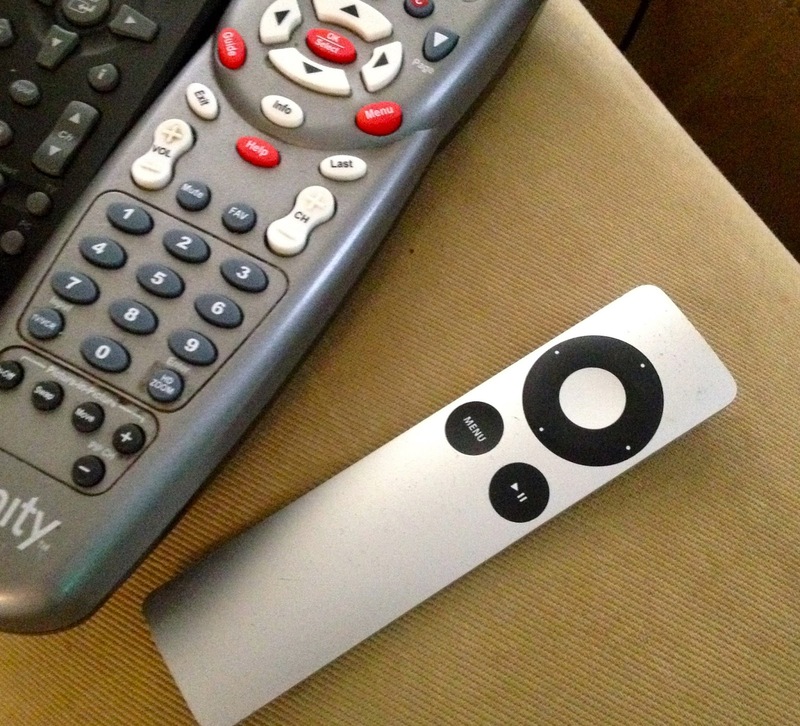 The Apple TV clickers are small and skinny, which some call a sleek design and I call stupid. Stupid because it is just asking to get lost in our house of horrors. It took me two hours of obsessive digging and searching and the living room looked like robbers had ransacked the place with all the couch cushions in the middle of the room....but I FOUND THE STUPID APPLE CLICKER. It was one of those moments when the light was shining down and angels were singing. I was amazing. Ahhhhhhhhh! "You want to watch Daniel Tiger?" I asked Wade. "Well, you can, right now, because of me." As I was reveling in my amazing-ness, I realized I better go pick up my oldest at school. Peyton had stayed after for basketball tryouts and I was pretty sure the time I was supposed to pick him up was 6. He hadn't said anything differently when I texted him earlier in the evening. It was dark and cold and rainy, the kind of night you want to be inside. Reluctantly, I gathered up the other children and we got in the minivan and headed to the school. There was Peyton standing outside. He got in the van and I greeted him with a Mrs. Doubtfire-inspired "Helllloooooo." "Mom, you are 40 minutes late," he said angrily. "I was locked out of the school and my phone died. I've been waiting in the rain and the dark. Where were you?" "I am so sorry, I had no idea," I said apologetically. There were no angels, no light shining. "Um, well, I found the stupid Apple clicker," I added hoping he would be impressed. He wasn't. I went from being the hero who would bring the masses their beloved streaming television shows to being the idiot who got the time wrong and left their teenager out in the rain. Somehow I found a way to blame the whole mess on Tim. "Well, your dad gave me the wrong time and you know how he is," I said. It may not have been the nicest way to handle the situation, but to be fair I was still on a power trip and Tim was napping in peace when all of this went down. I wish I could say these situations were rare, but they aren't. Every damn day is filled with small victories and small (or big) screw ups. It's a roller coaster, a big one not for wimps. It's highs and lows and happy and sad and "you're the worst mom!" and "I love you mom!" and getting it right and getting it wrong. It's a ride, it's a trip and it's mostly pretty damn amazing. And those moments with the whole light shining down and the angels singing? Yeah, you got to hold onto those moments. I'm glad you found the Apple clicker :) And you already know my mom-car-lateness story. It really is about the ups and downs and all-arounds, isn't it? I told my kid that if he wanted a ride home from school HE needed to put it on the calendar. We have an electronic calendar, and he has about 4 different devices available to him so there should (ha) never be a 'but you were hogging the computer...' excuse. Well, you can't please everyone - though finding the Apple clicker sounds like it will! You know, I used to have it all together. I used to be early everywhere I went. I used to not miss appointments or forget to answer emails. AND THEN I HAD FOUR KIDS. You are so right! Not a day goes by when I can't find something or I set something down absentmindedly, and it's something I absolutely need to get out the door. I blamed Christian this morning, because he had driven my car last and didn't put my keys back on the hook. If there's ONE thing I do consistently in this house, it's put my keys on the hook so I'll know where they are. But every time he drives my car, the keys end up somewhere else. Usually on his desk, which he says is second best because I still know where they are, but no. I NEED THEM ON THE HOOK. I died laughing because I can totally see you saying that Daniel Tiger bit to Wade.